You can’t eat a flag, a Peace Bridge or a cenotaph, but that doesn’t mean all three aren’t important. 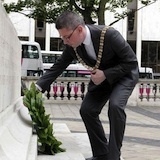 On Saturday, the Sinn Fein Lord Mayor of Belfast laid a laurel wreath at the City Hall cenotaph. He did this a couple of hours before the Royal Irish Regiment and the Light Cavalry Band arrived and laid their poppy wreath. The Lord Mayor’s actions have really annoyed a number of unionist politicians. EH? The Shinners in the person of the Lord Mayor are placing wreaths honouring Irishmen who fought and died in the uniform of the British Army, and this is annoying some unionist politicians? Well yes, because you see they want the Lord Mayor and Shinners generally to attend their wreath-laying ceremony, not a Shinner one. Seemingly concerned to placate, Mayor Niall O Donnghaile has said Sinn Fein would “consider” attending a wreath-laying ceremony with unionists if the British Army people - the live ones - aren’t in attendance. Did this suggestion make matters better? Ha. And double Ha. Ulster Unionist MLA Michael Copeland responded by saying the offer “flies in the face of the recorded history of this island”. Himself an ex-UDR man, Mr Copeland went on to talk about a Royal Irish Regiment event he was at where one of the “most magnificent” soldiers was from the south of Ireland. (No, I don’t get that one either but let’s not get distracted.) The DUP leader on Belfast City Council, Robin Newton, wants the mayor to “reflect on the hurt his actions will have caused and to reverse his stance in time for Remembrance Day”. Nice one, Michael and Robin - excellent stuff. As things stand, a fair-sized number of nationalists/republicans have serious reservations about their politicians paying tribute to Irishmen who chose to don British Army uniform and died wearing it. It’s a bit like the way Argentines might react if a number of their fellow-countrymen chose to join the British Army and died wearing its uniform. There’s a part of nationalists/republicans that feels sadness and even admiration for the courage of their fellow-countrymen and the sacrifice of their lives, but there’s another part that recoils at the idea of Irishmen becoming part of the British armed forces and helping fight Britain’s wars. So they have at best mixed feelings about the present wreath-laying arrangements - two separate ceremonies. If the Shinners go another step and attend a ceremony along with unionist politicians, those mixed feelings may take a marked turn for the negative. And if the Shinners attend a ceremony which is surrounded by British army military trappings, including live British army soldiers, many nationalists/republicans are going to feel even more uneasy. Maybe beyond that. Maybe angry as hell. Of course, that could be what unionist politicians would like to see happen - uneasiness change to irritation and even anger against the Shinners. If that’s their plan, it’s either a very stupid plan - the more people become disenchanted with Sinn Fein, the more they will cast about for another, maybe more clean-cut and/or violent alternative - or a very clever one. How’s that - clever? Well, if as UUP leader James Molyneaux once remarked, peace is the greatest threat to the union, then from a unionist perspective, anything that would weaken that threat, in the highly-organised form of the Sinn Fein party, would be most desirable.